This has been the summer of the anti-choice crusade against women's rights, with conservative legislators in numerous states working to legalize harsh abortion restrictions. Unsurprisingly, the result of the damaging laws is that women across the country are crossing state lines to obtain safe (and sometimes not safe) abortion procedures. As ThinkProgress points out, this means women's access to proper reproductive healthcare boils down to two things: where she lives, and her economic privilege. Here's a breakdown of what is happening across the country. In Virginia and Pennsylvania, women are going to Maryland to gain access to abortion clinics. In Virginia, women are required to undergo a mandatory ultrasound before having an abortion. The state also refers women to right-wing "crisis pregnancy centers" that don't actually provide abortions, but do try to talk them out of their decision, often using lies and misinformation. Pennsylvania, for its part, has mandatory state-sponsored counseling, as well as a required 24-hour waiting period that means women have to make two trips to the clinic. Both states have passed unnecessary restrictions on abortion clinics, forcing some to shut down — meaning that, for example, in Pennsylvania, a state of 46,055 square miles where 82 percent of the counties have no abortion provider, a woman might have to drive quite a distance to get to an abortion clinic, twice. To avoid waiting periods, unwanted counseling, and unnecessary ultrasounds, women from these states travel to Maryland for abortion procedures, where law mandates the state may not interfere with a woman’s decision to terminate a pregnancy. NARAL Pro-Choice America gave the state an 'A' on choice-related laws — Pennsylvania and Virginia both got 'F's. "The distribution of abortion providers in Maryland — fairly liberal state, fairly liberal government — reflects economics," Mark Graber, a University of Maryland law and government professor and author of Rethinking Abortion, told the Carroll County Times. 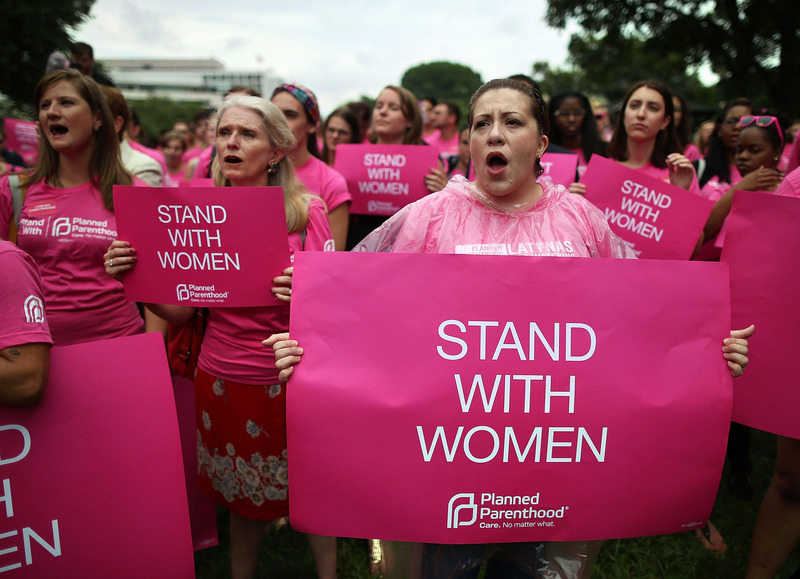 "The distribution of abortion clinics in many western states reflects hostility." A black market for abortion care might emerge in Texas, where abortion is all but banned. Texas recently passed a harsh anti-abortion law that will force 37 of the state's 42 abortion providers to close. As Women In The World explains, Texas is embracing an experiment to see if a state can end legal abortion without actually banning it. The new law will force most women to travel outside Texas to get an abortion, which can drive the price up to thousands of dollars. The Dallas Observer came out with a satirical travel guide on where to take an "abortion roadtrip" in order to obtain proper healthcare. "If you're far from a major Texas city and are too poor to travel across the country..." the guide reads. "Uh, this is awkward, but we have no travel guide for you." What the indirect ban means is that a black market for reproductive healthcare will almost certainly emerge in Texas — but it will likely be less safe than similar black market situations in pre-Roe v. Wade days, when medical professionals were usually the ones offering abortion services. Since abortion is theoretically legal across the country, the risks of offering illegal procedures in certain states are too great for medical professionals to consider. "This law will lead a lot more women to try self-abortion," a 24-year-old food server and student named Jackie who was in the health center last week for a follow-up medical examination after getting a legal abortion told the New York Times. Reproductive rights activists suspect Texas women will cross the Mexico border in order to acquire abortion-inducing black market drugs. In Nuevo Progreso, a Mexican town yards away from the border, pharmacists sell pills to "bring back a woman's period" at discount prices: $35 for a box of 28 generic pills, or $175 for the branded Cytotec. When asked how women should take the pills, some pharmacists said they did not know. Others recommend absurdly different methods that doctors say could be unsafe. These are just a few of the states where out-of-state travel to abortion facilities is taking place. Data on out-of-state abortions exists, and the fact that it's out of date makes the figures that much more troubling. The most stringent anti-abortion restrictions women face today have been enacted in 2011 and beyond. So when The Atlantic cites a 2005 study in the Annual Review of Public Health found that “nearly one-quarter (24 percent) of women seeking an abortion travel 50 miles or more to find a capable physician," it's likely that that percentage is actually much higher in 2013. The same thing goes with the statistic showing over one third of women seeking abortions in North Dakota and Kansas do so out of state. The Centers for Disease Control records high numbers of out-of-state women seeking abortion care in other states still, such as Alabama, Tennessee, and Rhode Island. But once again: the Centers' numbers are from 2009. Women in Ohio, where conservative legislators are pushing for even more restrictive abortion laws than the ones that became law in June, are also leaving the state to seek abortions. "It's not necessarily just based on a woman's location, but also how far along she is," Tina, a worker at Akron Women's Medical group, said via phone. Ohio requires viability testing, which means abortion providers cannot commit to providing an abortion past 19 weeks gestation. ThinkProgress reports that access to abortion in many red states may be worse now than it was before the procedure was legalized under Roe v. Wade.